Goalies are the last line of defense between the ball and the net. To make the save, they need the right gear – and that means wearing the best cleats. Power, traction and comfort are the three key important things. Without them, it’s all too easy to slip as you dive and miss the save. FG: Firm ground. Designed for firm natural surfaces. These cleats use molded studs to provide maximum traction. FG shoes are one of the most versatile and popular choices for play on natural surfaces. SG: Soft ground. Designed for wet or soft surfaces. These shoes have fewer studs that are placed farther apart and can be replaced. Some newer models, however, have bladed studs that cannot be removed. SG cleats are a popular choice among professional players, but aren’t ideal for firm pitches. If the ground is too firm, you may experience injury or pressure pain from the studs. HG: Hard ground. Ideal for hard or artificial surfaces. HG cleats are built with a large number of studs distributed evenly throughout the outsole. These shoes are a great option as a backup pair of cleats, or for use on frozen ground and artificial turf. Turf: Hard surfaces. Turf cleats have a hard rubber outsole with small rubber studs to improve traction. They’re typically not a first choice for players, but are a good option for training or as a back-up pair of shoes. Indoor: Indoor surfaces. Designed for indoor soccer, these shoes have a flat, non-marking rubber outsole. The type of cleat that you choose will depend on the field you play on, but most goalies rely on FG cleats because they offer the power and traction you need to make quick moves without missing a step. To help you find the best pair of goalie cleats for your needs, we’ve rounded up five of the best shoes on the market. adidas Performance Men’s X 15.4 – Ideal for artificial turf or firm ground, the X 15.4 from adidas is lightweight, yet provides you with the power and traction you need for explosive movements. The soft lining makes this shoe comfortable to wear, while the robber sole is both flexible and durable. Three colors are available, too, so you can choose a shoe that fits your personality. The claw stud design allows for quick movement without slowing you down. The ultralight upper material also makes it easy to control the ball even at high speeds. If you want to invest in the best goalie equipment, the X 15.4 should be at the top of your list. Nike Men’s Mercurial Victory V Fg – Nike’s Mercurial Victory V is an FG cleat with a sleek design that doesn’t compromise on performance or comfort. The TPU outsole runs along the entire length of the cleat, providing you with maximum traction in all directions when playing on firm, natural ground. In the comfort department, this cleat excels. The midsole features a contoured sockliner and textile top cloth to provide you with comfort throughout the entire game. The shoe’s low profile adds to its visual appeal and comfort levels. Developed by one of the most trusted soccer brands in the world – Nike – the Mercurial Victory V delivers the traction and power goalies need to make the save. Nike Hypervenom Phelon II FG – The Hypervenom Phelon II is bright, bold and designed to give goalies the flexibility and traction they need to stay in the game. The shape of the shoe is anatomically correct, so the shoe fits your foot like a glove. The lacing area is asymmetrical for better ball contact and a larger strike zone. The specially designed TPU plate provides you with maximum traction while boosting acceleration and support. Meanwhile, the perforated sockliner relieves pressure while adding more comfort. Available in a bright orange color with black accents, these cleats are a great option for goalies that need a little more support and comfort. 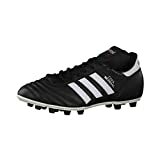 adidas Performance Men’s Copa Mundial Soccer Shoe – With a kangaroo leather upper and a dual-density outsole, the Copa Mundial is the shoe of choice for serious players. It’s comfortable, durable and provides maximum traction when playing on firm ground. The leather upper is incredibly durable and able to withstand all weather conditions while providing comfort. The outsole is direct-injected, providing you with the footing you need to save the ball and win the game. Many players say that the Copa Mundial is the best cleat you can buy, offering maximum foot control and excellent traction without sacrificing comfort. Although pricier than other models on this list, this shoe is well worth the cost if you’re an avid player. Nike Men’s Mercurial Vortex II Fg – An FG cleat with an unforgettable design, the Mercurial Vortex II is comfortable, lightweight and features a full-length TPU outsole. The bladed and conical studs add to your speed while providing you extra support, traction and height. The EVA sockliner adds lasting comfort and shock absorption, while the padded tongue and collar make these shoes feel light as air. The synthetic leather upper’s micro-texture pattern maximizes ball control, too. Available in multiple colors, you can choose a shoe that fits your playstyle and personal taste. If you’re looking for explosive speed and unbeatable control, the Mercurial Vortex II may just be the right choice for you. Arguably one of the most important features, traction is absolutely critical when playing keeper. One slip or exaggerated move can result in a mistake, and that mistake can lead to your team giving up a goal. If you play on natural firm surfaces, FG (Firm Ground) shoes are best, but if you play on softer, wetter ground, an SG (Soft Ground) shoe is best. The firmness of the pitch will determine which shoe you choose and ultimately, the amount of traction you get from your shoe. Never underestimate the importance of comfort. If your shoes are uncomfortable, you can’t play at your best. Always opt for better comfort even if that means spending more. Naturally, you want to choose a pair of cleats that fit you well. The better the fit, the better you’ll play. You want the shoe to be comfortable without being too loose, and supportive without being too tight and restrictive. Price is another concern, and will likely determine which shoe you ultimately purchase. If you play regularly, it’s often best to spend more on a higher quality shoe than to purchase a low-cost shoe that you’ll need to replace often. Go for the highest quality you can afford, and your shoes should last you several seasons.